The US nonfarm payrolls report will be released today by the Bureau of Labor statistics. Forecasts call for 186k jobs being added during the month while the US unemployment rate is expected to fall to 4.80% from 4.90% in July. The payrolls report will be closely watched by the markets as a better than expected print on the expectations could significantly raise the odds for a Fed rate hike at the next FOMC meeting on September 21st. Earlier this week ADP private payrolls showed 177k jobs being added, slightly above forecasts with upward revisions to July’s payroll report. The manufacturing sector in China posted an expansion according to data from the National Bureau of Statistics. The official PMI was recorded at 50.4, beating forecasts of 49.9, which was the same reading seen in July. With the official PMI rising above 50, the index marks an expansion in the sector. Data also showed that non-manufacturing PMI was recorded at 53.5 which lower than 53.9 in July. However, Caixin manufacturing PMI showed different results as the PMI for August was seen at 50.0. Economists were expecting to see an increase to 50.1. In July, Caixin manufacturing PMI was at 50.6. Caixin's PMI report showed that production and new orders advanced at a slower than expected rates while export sales declines. 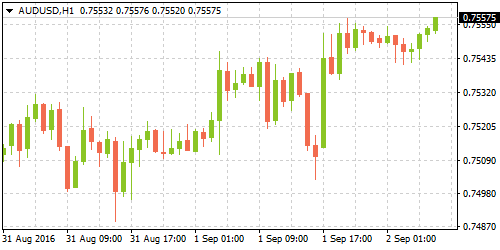 Australian retail sales data in July was unchanged on a seasonally adjusted basis, according to data from the Australian Bureau of statistics. 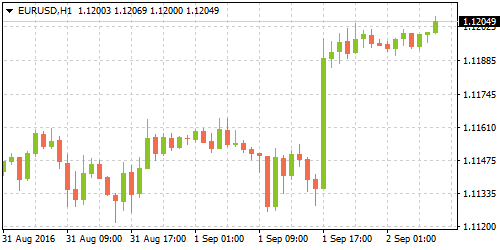 This was lower than the forecasts of a 0.30% increase during the month as retail sales was recorded at 0.10% in June. Although there was an increase in food retailing which rose 0.70%, department stores and household goods fell 6.20% and 0.70% respectively. 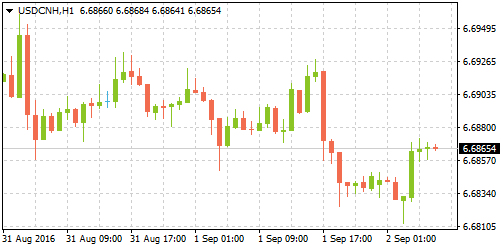 In another report released by ABS, Australia's capital expenditure fell 5.40% in the second quarter of the year, missing forecasts of a 4.10% decline. Q2's decline in Capex marks a second consecutive month of declines after capital expenditure fell 5.20% in the first quarter. Manufacturing activity in the UK posted a strong rebound in August, rising back above the 50-level of the PMI index, data from Markit showed on Thursday. The manufacturing PMI index increased to 53.3 in August, recovering from a 41-month low of 48.3 in July. Forecasts called for a moderate increase to 49.0. Markit said that while companies reported that work was postponed during July, there was a steady increase in orders with business returning to normal. 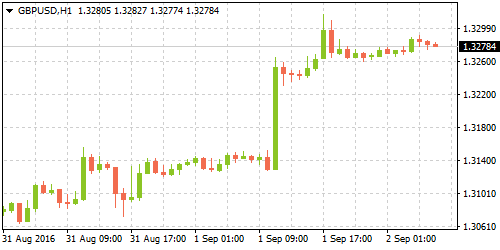 Previously analysts expected the UK's economy to take a hit following Brexit, but economic data after the referendum continues to suggest that the fears were over rated.